Toroidal Transformer Winding Machines, Toroidal Transformer Tapping Machines, Toroidal Coil Winding Machines, Winding Machines, Heavy Duty Winding Machines, Transformer Winding Machines, Transformer Teping Machines, Transformer Winding Machines as an active Manufacturer, Supplier, Dealer, Distributor, Trader and Seller etc. (*Importer/Exporter/Service Provider). 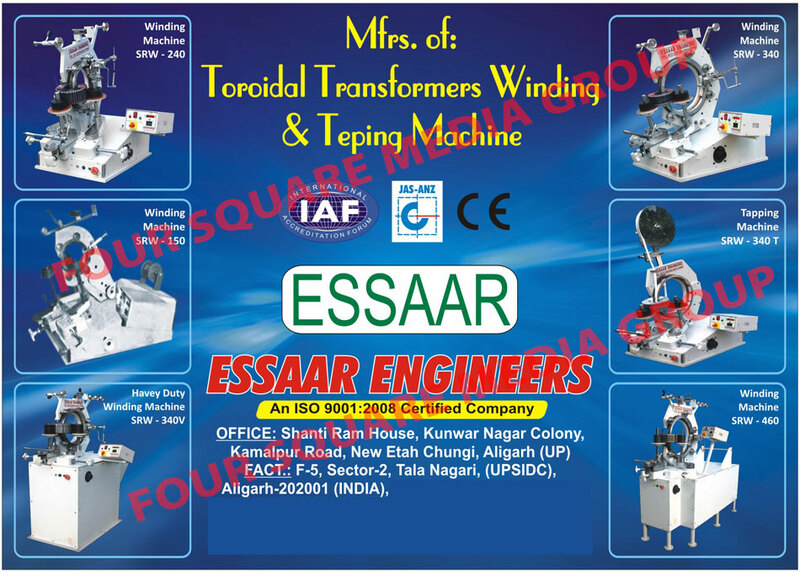 Essaar Engineers is one of the leading manufacturers of Toroidal Transformers Winding and Tapping Machines and catering to the needs of electrical industry. We are renowned name in the arena of manufacturing toroid coil winding machines used for the winding of toroid coils, toroids transformers, toroids chokes. Our company offers single window solution for all kinds of toroidal coil winding machine equipment. State of the art manufacturing facility of the company is equipped with latest machines and equipments to manufacture world-class toroid winding machines. Dedicated and professional workforce is sparing no effort to produce most comprehensive line of toroidal coil winding machine equipment.